How often does spending big in free agency actually result in winning more games the next year? Thank you for asking this question, voice in my head, because I was wondering the same thing. What I want to look at are the teams that spent the most money in the offseason and then how they did the year following with their new toys. Given that we’re Twins fans here, payroll has never been a topic of discussion. No one has ever been annoyed at the lack of big spending in free agency and is always perfectly OK with how the front office allocates their resources, especially this year. Free agency is supposed to be an opportunity to right the sinking ship through veteran additions to a low-talent roster (Texas), to fortify a good roster to take their team over the top (Boston), or to sit around and talk about how good the farm system is (San Diego). Every year, we see the offseason as a chance for teams to flex on small market franchises by throwing money at players like drunken pirates. Nowadays it isn’t as prevalent, but teams are still paying players for their services for the next year or beyond. But is that a recipe for success? The process is quite simple: Find the top 10 spending teams in an offseason over the last five years and then see where they ended up the following year. I’ll rank them by total money spent so that the Padres’ brilliant Eric Hosmer contract screws them over a lot because they deserve to be ridiculed. Information will be used from Spotrac, let’s see what it says! A few things are already looking interesting here! The Cubs slide into the top spot because they handed out contracts to pitchers like Yu Darvish and Tyler Chatwood who both probably are sleeping in their beds of money, grateful for their agents, while the Ricketts continue to try to print money in order to scrape together a hitting coach that they won’t throw under the bus. Other than that, a great number of the top teams are up there because of financial promises to a single player. Some were great (J.D. Martinez with Boston), some were very good (Lorenzo Cain with Milwaukee), and some were terrible the second they were signed (everyone with the Rockies). Altogether, the top 10 in spending netted +6 wins overall or +34 if you want to ignore Baltimore, which is a good plan for just about everything. Only 3 teams went negative in wins the year after spending like a redneck at a gas station with one of them being, of course, the Twins... great luck there. Let’s go back one more year now. Ah, 2017, a simpler time, a time where Dexter Fowler received the third-most expensive contract of the offseason and Ian Desmond got the fifth. I have to say, I like seeing the spread of typically smaller spending teams here like Miami, Cleveland, and Colorado. It really just warms my cold, frozen heart. Overall the top ten spending teams netted a whole -1 more wins than the year prior but that number becomes +22 if you throw out the massive outlier in the Giants. 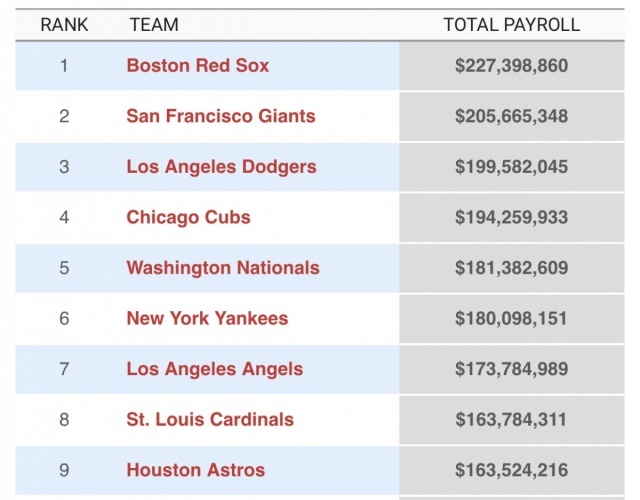 The Dodgers were by far the biggest spenders but most of it was them keeping players they already had like Kenley Jansen, Justin Turner, and Rich Hill, leaving Sergio Romo and his $3 million payday as their highest paid free agent who came from another team. All in all, this list translates fairly well to success when considering the context of which players were brought in for which team. Houston added a few veterans who turned them into a World Series champion, Cleveland added Edwin Encarnacion to legitimize their lineup and lead them straight into and out of the playoffs after the first round, and the Yankees added back Aroldis Chapman after swindling the Cubs into trading yet another top prospect for pitching. Although, someone should have told St. Louis not to invest over $110 million into Brett Cecil and Dexter Fowler, yikes. The first obvious thing to note, what the hell was going on in this offseason? Are you guys seeing the amount of money that teams were spending here? We talk about the horrible offseason in 2018, but it looks like free agency actually started going downhill a year before that. Maybe it was a fluke year, but teams were dropping money like upper-class toddlers at Toys R' Us on their birthday. All for elite names like Chris Davis, Jason Heyward, Ian Kennedy, and Jordan Zimmermann. Freakin' Jeff Samardzija got $90 million this offseason. What was going on back then? Luckily, there isn’t some massive outlier team, so adding up the wins gained/lost results in a cool +9 overall. I do love how the Twins biggest signing that offseason was David Murphy, who decided that he would rather not play baseball the rest of his life than play for the Twins. And this was after an 83 win season! The next biggest acquisition was Carlos Quentin who you definitely forgot was technically a Twin, leaving the only impactful addition being Fernando Abad who was signed to a minor league deal, great stuff Terry Ryan, it’s a wonder that it took him that long to be canned. Despite that Heyward contract looking like the albatross to end all albatrosses, the Cubs dropping nearly the GDP of the Republic of Palau that offseason brought them to the promised land thanks to other veteran signings like Ben Zobrist, Dexter Fowler, and John Lackey. We finally reach the infamous 2015 offseason where Max Scherzer and Jon Lester got paid handsomely and actually provided good value for their team while Pablo Sandoval and Hanley Ramirez also got paid well and did whatever the opposite of providing value would be. 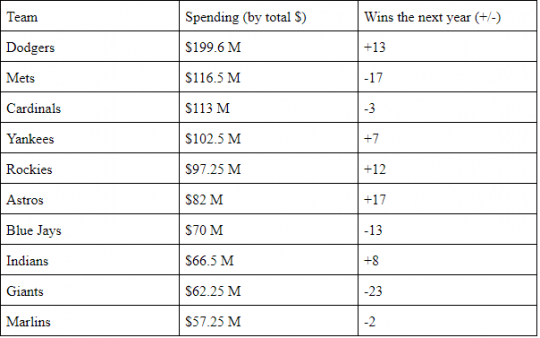 Overall, the top spending teams netted +38 wins overall which still stays a +14 even if you throw out the outlier Cubs. There isn’t too much to really report here, spending was about what it typically is. The Royals added some garnish to their eventually World Series-winning club with the signings of Edinson Volquez and Twins legend Kendrys Morales. Hell, they even gave Alex Rios $11 million that offseason to kind of just hang around and do Alex Rios things. This was also the year where the Twins handed out their biggest contract ever to Ervin Santana which went pretty well and they also decided to bring back Torii Hunter for old times sake, which went less well, but who cares? Torii was back! What a strange offseason this was, the Mariners absolutely shocked the world when they gave a 31-year-old Robinson Cano a 10 year, $240 million contract and then later shocked no one by not keeping him through the whole deal. The Rangers gave Shin-Soo Choo $130 million and then lost 24 more games than the year prior. The Yankees decided to back the dump truck of money up for veterans like Jacoby Ellsbury, Brian McCann, and Carlos Beltran and I’m sure that they would still do that Ellsbury contract again if they could. The Twins slot in as the fourth-highest spending team mostly thanks to the elite three-headed Nolasco-Hughes-Pelfrey starting trio. They also tried to bring back Kubel, Bartlett, and Guerrier, all of whom failed miserably and proved that you do in fact become the villain if you live long enough. Kurt Suzuki was a nice cheap find here who made the All-Star Game despite being signed for less than $3 million in the offseason and is still kicking after getting a nice deal from the Nationals this offseason. 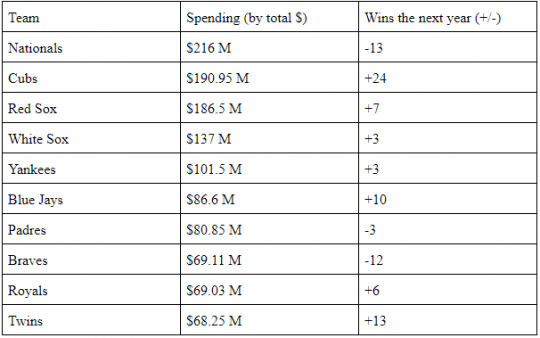 Overall the top 10 spending teams netted +16 more wins than the year prior and there is something kind of hilarious about the second highest spending team going +26 while the third highest went -24. Interestingly enough, the Giants won the World Series that year despite their biggest signing that offseason being a Tim Hudson who was collecting social security at that point and needed a walker to get to the mound. All right, that’s a lot of information, but what narratives can we draw from this? Overall, through five years of data covering 50 individual team seasons, the top 10 spending teams netted 68 more wins or an average of 1.36 more games won than the year before. Throwing out any season that ended in a +20 or -20 to control for outliers brings the number to 93 more wins total, or an average of 2.07 more games won than the prior year. So, there is a very slight positive correlation between spending money and winning more games than the year before. 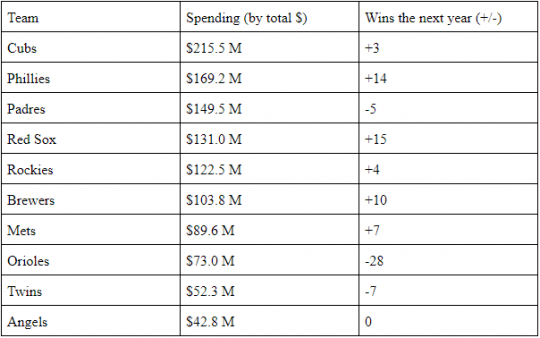 Let’s get even more specific here: The top spending team over each offseason overall won eight more games than the year before, or an average of 1.6 more games won. Teams that were top three in spending in a given year won 41 more games than the year before overall, or an average of 2.73 more games. Teams that spent more than $200 million in an offseason overall netted 45 more wins the next year, or 4.5 more games on average. For me, this data is certainly interesting, but nothing really groundbreaking or astonishing. 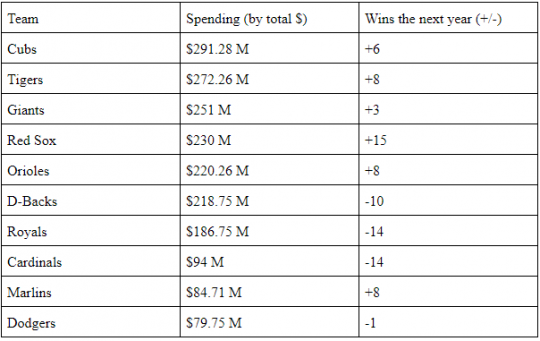 Spending more does indeed have a general slight positive correlation with winning the next year, but the numbers weren’t exactly eye-popping to me. Just an average of one to two more games won than the year prior. That total is certainly an improvement, but not such an incredible one that spending becomes such an obscene advantage over other teams that it isn’t even fair. 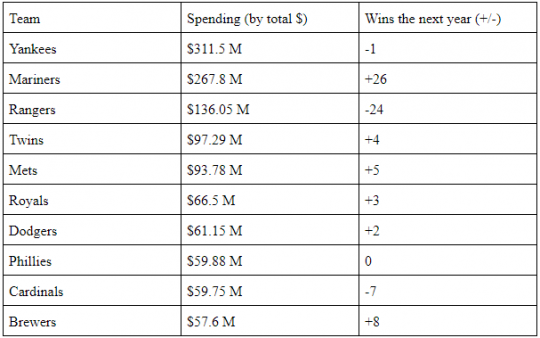 I also find it hilarious that the top spending team on average barely won more games than the year before... so much for a competitive advantage. I suppose if I had any other major conclusions, it would be that spending more than $200 million in an offseason without being the highest spending team would be the best plan of attack for teams who are inclined to do such things. As it pertains to the Twins, spending more would improve the team, but context is more important when considering how much a team spends. Yes, in general spending more will win a team more games, but it has been and will always be about how that money is spent more than how much of that money is spent. Spending will never save a bad team from the depths of irrelevance, but it can certainly lift a team up into the glories of the Postseason. The Twins are on 3 of those lists???? 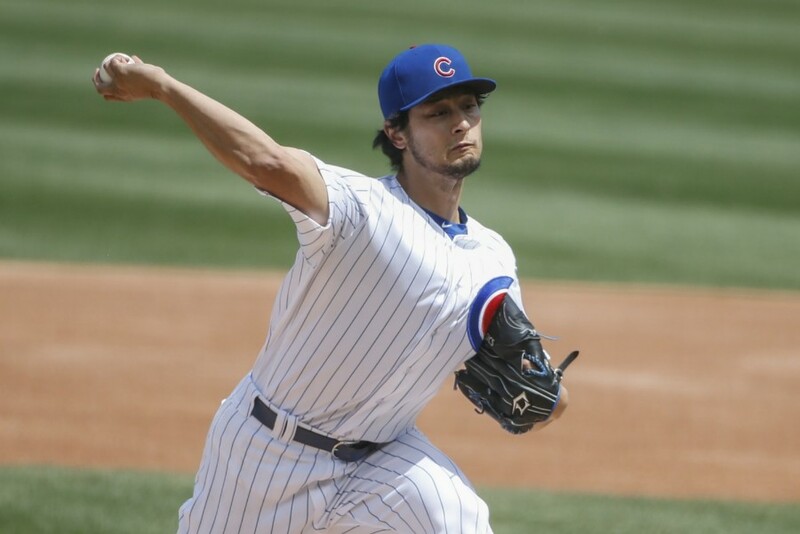 How's this for a thought experiment--shift the Darvish money from the Cubs to the Twins. I'll assume the wins total doesn't shift much or at all, since he was basically out for the year. Cubs look much better though, and the Twins would have spent a lot of money for nothing. Still, it seems to be fair you'd have to get more, um, granular? Like if Darvish wins the Cy Young this year but his contract isn't counted against the Cubs spending this offseason, which is close to nil, right? What then? They look like super-thrifty value shoppers for this year. Nonetheless, in an instant gratification, who-won-the-offseason type of world, this is a fun way to look at things. That's a very fair thing to consider but is pretty difficult to track in actuality considering the amount of nuance that such an idea takes. Trying to track an individual player's impact beyond the first season they came in can get kind of messy. It would be another interesting article if I could think of a way to standardize such data. But yeah, the point was mainly inspired by so-called "offseason winners" and how often that title was actually true. Interesting, but many/most of these contracts are for more than one year, so it is pretty harsh (especially for situations like Darvish) to count the entire contract $ but not the entire contract-period wins. Interesting that the Red Sox were an accumulative +37 for the years on this list. Good scouting plus lots of money go far, I guess. Recent studies show money is correlated with sustained success. Any team can pop up or down in any year, but few can sustain winning without spending. 3.) Win about the same amount. Excellent article. Surprising the Twins are on three of the five lists. Seeing as they are not in the top ten in overall spending in any of those years, I think there is a pretty solid conclusion to draw: the Twins have been awful at developing players of their own worth paying money to. I don't understand how counting the entire contract in year one gives you a true outcome. Then again I don't understand a lot of things. I didn't take a dang thing from the data in this article. But I got this one thing from it: I want to read more stuff written by Matt Braun. You're an excellent writer. Enjoyed the article! And the poke at "winning the offseason". I've often wondered why some treat free-agent signings as if it's a game and a season all by itself. Maybe major league baseball should set up a handicap system where the team that spends the most acquiring free agents gets an extra run added to each of their playoff games... if they reach the playoffs. Or two runs added per game if they make the World Series. Then this free agent signing thing will have a real effect on game outcomes. Until then, much ado about nothing. I've often wondered why some treat free-agent signings as if it's a game and a season all by itself. So what your saying is it's best to be a large market team. Never would have guessed. I appreciate the effort and the intent to examine the facts. However, there are far to variables associated with team wins to make it a viable measure of the relative impact of free agents. What if a team increased their win total by 10 games last year and their free agent acquisitions but the FAs produce 5 WAR. It does not make sense to say they improved by 10 games as a result of spending. What if the inexpensive free agents produced more WAR than the high price FAs? The spending would have had little impact. You have to quantify which free agents were productive if you want to make this assertion. For example, the Cubs had three significant free agents making an AAV of $10M+. (Darvish / Chatwood / Morrow). They collectively produced .3 WAR. They represent 86% of the $215M. Put another way, they spent $44,167,666 to produce .3 wins. The Phillies improved by 14 games how much impact did their FA spending have. They spent 169.2M or 62.1M AAV for Arietta / Santana / Hunter and Neschek who collective produced 4.9 WAR. Just so happens that’s the same WAR produced by Jed Lowry for $6M. You also can’t look at top spenders without comparing teams who succeeded without spending. Atlanta improved by 18 games and spent a total of 5,550,000 on 7 players. In other words, every one of them would have been labeled “dumpster dives” here. Tampa Bay improved by 10 games and spent a total of 6.5M on free agents. Oakland improved by 21 games. They spent a total of 21.5M at an AAV of 18.5 for 5 players or an average AAv of 3.7M. Again, this would have been deemed dumpster diving here. Anyone still wondering why front offices have become extremely cautious when signing high price FAs? It also makes no sense to evaluate the relative success of a spending strategy for the teams that can easily spend $100M more than the Twins. Such a team can sign a couple BP arms for $25M total and 3 other players at an AAV of $25M and still have the Twins budget left over to pay for 20 players vs 25 so they can spend 25% on the remainder of their roster too. Those teams do not represent a viable blueprint for the Twins. So if you're a middle tier starter you should start marketing yourself as a guy who's willing to be a middle reliever. If the market changes you need to change with it. That looks like a list of perennial contenders to me. Except for the Angels you could have said any of those teams were viable WS candidates on a preseason prediction. Money is the #1 factor. I think the Cubs will have a great year.They won 95 games with down years from Darvish, Bryant, and Rizzo.If just one of them rebounds they should be a serious threat for the World Series. The Cubs replaced Arrieta with Darvish. They spent the same amount of money they would have spent anyway. When the Twins move on from a high dollar star, they don't replace him at all, they pocket the cash. The stuff I read on this topic is always interesting. "Spending money doesn't pan out...."
"The Twins could never spend like the Yankees anyway..."
Cash may not be guaranteeing championships for the Yankees, but spending money keeps them in the conversation every year. Simply being in the conversation is extra revenue, and when you make the playoffs anything can happen. Just ask Gene Larkin. and when you make the playoffs anything can happen. Just ask Gene Larkin. I asked Ron Gant. He was less sanguine about this principle. I am not sure I understand your point. Are you suggesting all the Twins need to do is increase revenue by $350M or just spend like teams that produce over twice as much as they do? That's quite vague. How much is a little and what is your suggestion for smarter? What free agents this year would be smarter? The concensus here seems to be we need to get the really high profile guys. Who should they have got last year. Would they have been smarter if they got Darvish? Would Arietta at $25M for 2 WAR been significant? How about the 3rd highest paid SP (Cobb). Is that the kind of smart move that would have moved the needle. How about the top RP. Would they have been smarter had the signed Davis at $17M/yr to produce .9 WAR. How about the next highest paid RP ( Holland). Would his .3 WAR have made a difference? I know there were some Brandon Morrow supporters here. He was the next highest paid. Was his .6 WAR the solution. How about the highest paid position player. Would our FO been smarter had we signed Hosmer and his negative WAR. I guess you could say they would have been smart to sign Cain but signing a FA OFer when your supposed strength is a young outfield with all kinds of upside would require a crystal ball. EVERY business based on probable ROI. I can't blame them for not investing in the highest price RPs. The success of RPs is volatile. Smarter might be converting starters with a specific profile or targeting multi-inning pitchers, call them what you will. It's very easy to say they should be smarter when the failures outweigh the successes by 2:1 or more.